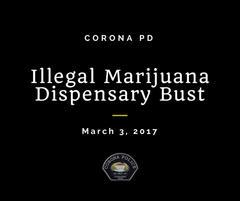 In early February, the Corona Police Department’s Vice Narcotics Unit began a joint investigation with Code Enforcement into marijuana dispensaries operating illegally in the City of Corona in violation of the City Municipal Code (CMC), state, and federal law. Several businesses have been identified as illegally operating marijuana dispensaries. The business owners and property owners have been served cease and desist letters by the City Attorney’s Office, and they have been issued administrative citations by Code Enforcement. As part of the ongoing investigation, the CPD Vice Narcotics Unit obtained and served a search warrant on Thursday, March 2, 2017 at Corona Genetics, located at 944 W. Sixth St., #115 in search of evidence of an illegally operating marijuana dispensary. The search warrant resulted in the arrest of five employees who were booked, cited, and ultimately released for aiding in the operation of a marijuana dispensary, a CMC violation. One employee was also charged with Possession of Marijuana for Sales, a misdemeanor. In addition, numerous pounds of bud marijuana, marijuana edibles, concentrated marijuana, cash, computers, documents, and miscellaneous items were seized. Code Enforcement and the Fire Marshal also noted several CMC violations by the property and business owner, for which administrative citations will be issued. The Corona Police Department and Code Enforcement will continue their efforts in identifying illegal marijuana businesses in the City of Corona and will be proactive in taking criminal and administrative enforcement to close those businesses and hold the responsible parties accountable. Anyone with information regarding marijuana dispensaries operating illegally in the City of Corona are asked to call Sgt. Skip Shatford, Vice Narcotics Unit at 951-736-2423.